Willow Smith has to be one of the luckiest celebrity spawn alive. She’s 15 and already has established a singing career and a modeling career! She appeared in a Marc Jacobs fashion campaign last year and this year she is Karl Lagerfeld’s muse – he loves her style. 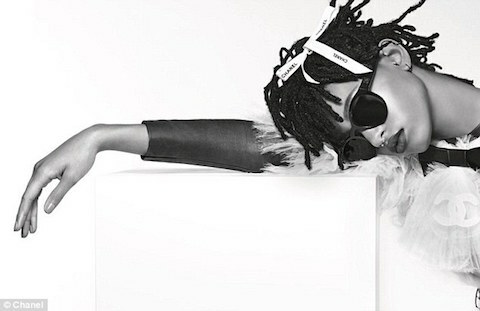 Karl personally selected Willow as brand ambassador for the Chanel eyewear campaign. Karl likes ‘em young – last year’s ambassador was Lily-Rose Depp, now 17. We don’t know how Willow’s music career is going, but she’s a big hit in the fashion world. Just one thing- is she a Scientologist? One more – will she get an education? Gwyneth Paltrow turned up at the Chanel Spring/Summer couture show at Paris Fashion Week in this matronly two piece suit. Karl Lagerfeld MUST have given it to her to wear to the event and she couldn’t say no. We can’t IMAGINE Gwyneth picking this out for herself. The square cut and stiff fabric along with the box pleated long skirt make Gwyneth look around 20 pounds heavier and when she sees these photos we bet she will privately vow NOT to take Lagerfeld’s advice all the time. Here’s a mini-mystery: Why is David Spade taking Brody Jenner’s girlfriend Kaitlynn Carter shopping at Chanel on Rodeo Drive? It was speculated that Kaitlynn might become engaged to Brody over the holidays- they are THAT serious. Adding to the puzzle is the fact that Kaitlynn is Spade’s EX-girlfriend! They dated before she met Brody. Is something happening here behind Jenner’s back? Whatever’s going on, Kaitlynn looks happy. Kristen Stewart is a reluctant fashionista at the Chanel show in Paris. She‘s done some ads for the fashion house so she had to show up in a Chanel outfit, but she’d rather be in raggedy jeans. Kristen impulsively got her new haircut just an hour before this photo was taken. Her next project sounds impressive – she’s costarring with Jennifer Lawrence’s cute boyfriend Nicholas Hoult in “Equals” – a futuristic love story. Yes, Karl Lagerfeld has brought back the fanny pack! Rihanna turned up for the Chanel show in Paris wearing Chanel from head to toe. Her fanny pack ($1300 and up) has a little gun on it. And the fancy sneakers (replacing the towering stilettos of yesteryear) are hand made with a couture pricetag of thousands. Rihanna is giving Lady Gaga a run for her money, fashion-wise.